Besides being useful for robbing obese tourists from those monstrously large cruise ships -- with their equally monstrous buffets -- that run aground in water that is too shallow, this bandana really helped keep the sunlight off my face. Not only is the sunlight more direct in Antarctica, there is still a great big hole in the ozone layer down there. So, there is less atmosphere to shield the direct rays from the Sun, relatively speaking of course. Also, the glaciers act like giant mirrors as many a snow skier finds out the hard way. With my hat and presently long hair, I remained pretty well covered. 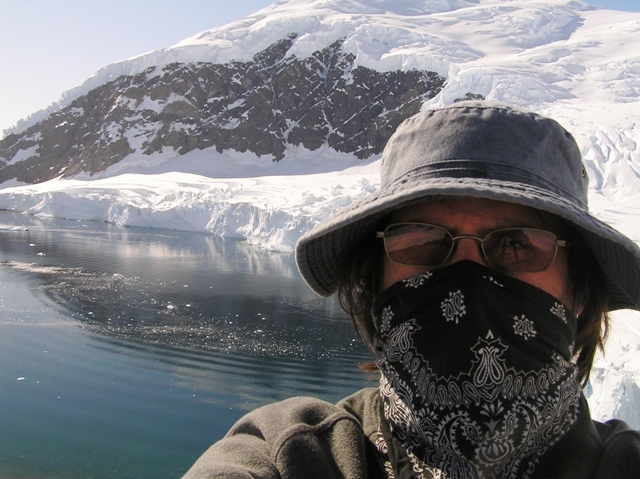 During the times it was very cold, which was less so than more so, my bandana also kept me warm. However, there was even a more important reason for the bandana. Penguin colonies, numbering in the tens to hundreds of thousands of birds, really stink.